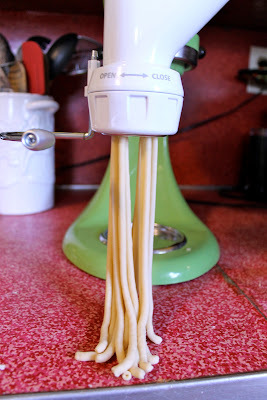 Ever since I got my KitchenAid mixer last Christmas, I was hoping and wishing and thinking and praying that someone--anyone--would get me the pasta press attachment. The sucker was expensive, and much as I like gadgets, I wasn't exactly up to affording the thing for no reason. Turned out, my birthday was the perfect reason for my hubby to splurge and get me this totally awesome attachment. I love making pasta. I make a ton of it because I rarely buy it. You can get my pasta recipe by clicking here . Once you have fallen in love with making pasta, there is no going back. The only thing I missed since I began my own pasta making adventures was the shaped pastas. I am shaped pasta kind of gal, what can I say? I just dig it... hard. So I would buy them. Shame. Shame. This pasta press changed all that. Truly. It's a thing of wonder. 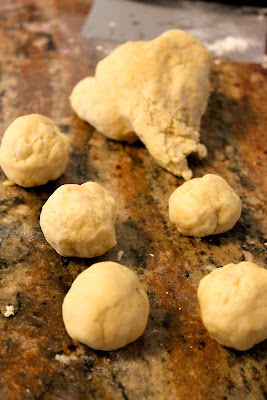 So you take your pasta dough...which you got from my recipe here and then you make into balls. They should be approximately the size of walnuts...big walnuts. Let's talk attachments. Because some of my KitchenAid mixer attachments are harder than others to figure out. The pasta press attachment was less complicated and I appreciated that. So you feed the walnut sized dough balls into the feed at the top. Once you turn it on, it takes just a couple minutes for the pasta to come out, but once it does, the pace is manageable. I used mine of a moderate speed of 6... I wouldn't push it too hard. Slow and steady wins the race right?! But on a serious note, doesn't this picture of the stove and the pasta press sort of look like a smiling face? The first pasta I had to make? Bucatini of course! Why? Because you can't get in stores around here! And the pasta cutter, you will be happy to know, works quite well. I discovered this when I accidentally turned on the machine without pulling it back, and then I pulled it back and got these little hollow noodle nubs. Then it dawned on me: you could totally make dintalini with this attachment! Minnestrone, here we come! Note how awesome bucatini is... 'cause it's all hollow and stuff, and I love that. Marvel at my drying pasta! I always make the pasta and just let it dry until I am ready to throw it in the pot. It's convenient. And yes, in case you were wondering, I made my drying rack of two wooden spoons and two cereal boxes. Overall, I really love my pasta press. 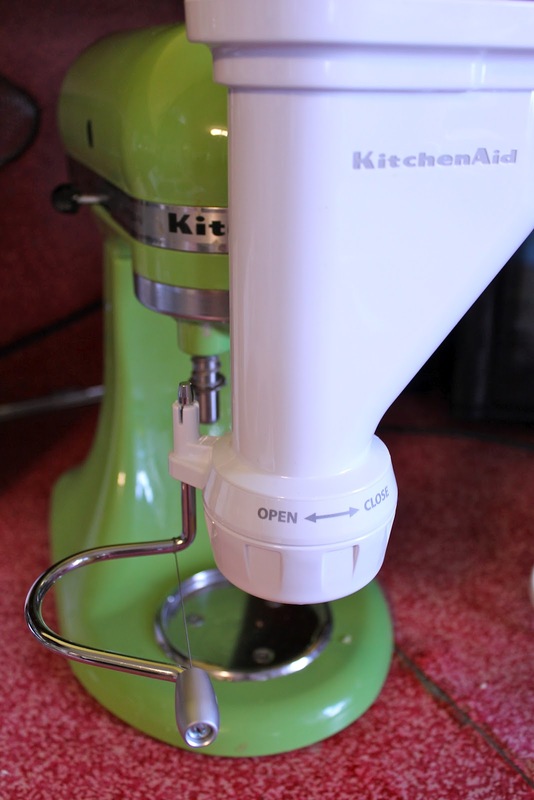 It's easy to operate, mostly easy to clean (well, those little pasta holes gave me a bit of trouble, but I used a kabob skewer and we worked it out), and the product it produces is AWESOME! Even though it is a pricey attachment, if you make a lot of pasta (or aspire to make a lot of pasta and think you will actually follow through) then it's a great buy. For the gadget guru in you, this will be a great fit! so glad I found this! I have a question though about the pasta press. I have used mine 3-4 times, and I am not happy with the dough I've used. I am not excited about how it extrudes, and tends to stick to itself as it comes out of the press. Any suggestions? Only add as much water as is necessary to bring the dough together, typically only 1 or 2 tablespoons per cup of flour (if that). While you can get away with a wetter dough for rolled pasta, you cannot with extruded pasta. It will just all stick together, as you've seen. 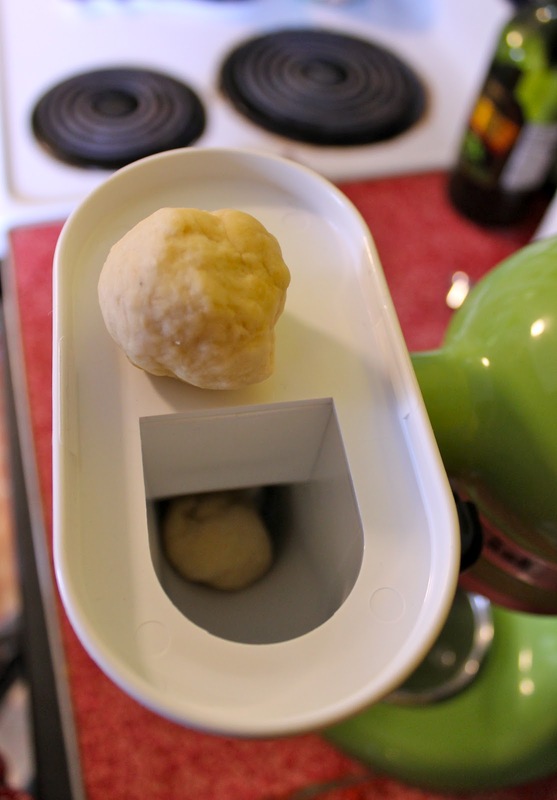 You also can set up a small fan to dry the pasta a little as it's coming out of the press. Some of the sticking happens if the press (and the pasta) heats up. That heated pasta is stickier (especially on the ends when cutting it). Turning the speed down for a little while also helps, there. Love the name Bossy Italian wife! I am one too! Is it possible to make "pasta" out of things like zucchini? We try to reduce our grains, but want to be able to make different pastas using vegetables. From The Canning Vault: Applesauce! Things We Made With APPLES! Someone Left The Light On... It Was Me. My Oven's Broke...No-Bake Cookies It Is!